There's almost too much to mention today, as my obligatory Sunday newspaper reading rituals revealed some great finds. 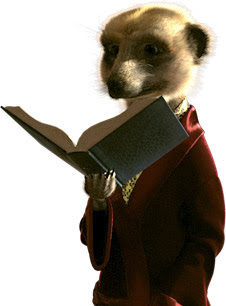 The author who created the memoir of a meerkat; A Simples Life: My Life and Times by Aleksandr Orlov, has been revealed as Val Hudson. For those of you who are not aware of the meerkat phenomenon (I'm not sure how global this craze is), the meerkat's shot to fame in a GoCompare advert have captured the hearts of a nation. To see what all the fuss is about I suggest you view the compare compare the market/compare the meerkat and jacuzzi meerkat adverts. So far the craze has not only made GoCompare a raging success, but Clinton's cards cashed in on a Meerkat range of bookmarks, mugs and other merchandise, and Boots offer an adopt a meerkat gift. Now Val Hudson, a former publisher for various publishing houses including HarperCollins and Headline, is set to make millions. Currently A Simples Life is number two in the bestsellers chart, rating higher than Tony Blair's and Keith Richard's autobiographies. Whilst I'm not convinced on the literary credentials of such a piece of work, I am curious to read the memoir of an infamous meerkat. And finally, I hope you have all enjoyed your Halloween. Don't watch too many scary movies this evening!